Wow, another week just zoomed by! I guess they're right, time flies when you're having fun. We're having lots of fun in the sun...grilling, watering the veggie garden (or splashing everything in sight with the hose), and attending lots of family parties. Here’s what’s on the menu at our house this week. Although, we may skip a planned meal over the weekend to take a bike ride with a picnic instead…fun, fun, fun! Monday – Easy Mini Pizzas topped with Assorted Veggies (Recipe Link to be posted this week) – I’m going to let my 1 year old help make dinner...sounds super messy, but it should be lots of fun! Saturday – Soy Ginger Soba Noodles with Steak and Sautéed Veggies (Broccolis, Onions, Peppers, and Mushrooms) – Tastes better than takeout to me and its super easy to prepare with an Organic Annie Chun meal starter I purchased inexpensively using a coupon from Coupons.com. I just add fresh veggies and a lean protein for a quick dinner on a busy night. Do you need menu planning inspiration? 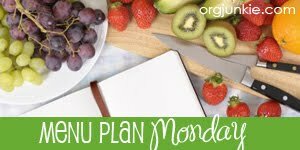 Go check out all the great menu plans at I’m an Organizing Junkie and the new What's On The Menu Wednesday at Dining With Debbie. Come join me for the inaugural edition of What's On the Menu Wednesday. I'd love for you to link up with Mister Linky. Thanks.